With summer quickly slipping through my fingers, I have shifted into full-boogie mode. I've got my game face on and I'm prepping for the coming year. While I hold fast to my summer days desiring to relish each and every one, I am also committed to using this slower-paced-schedule to ready myself for the fall and all the wonderful learning adventures on the horizon. 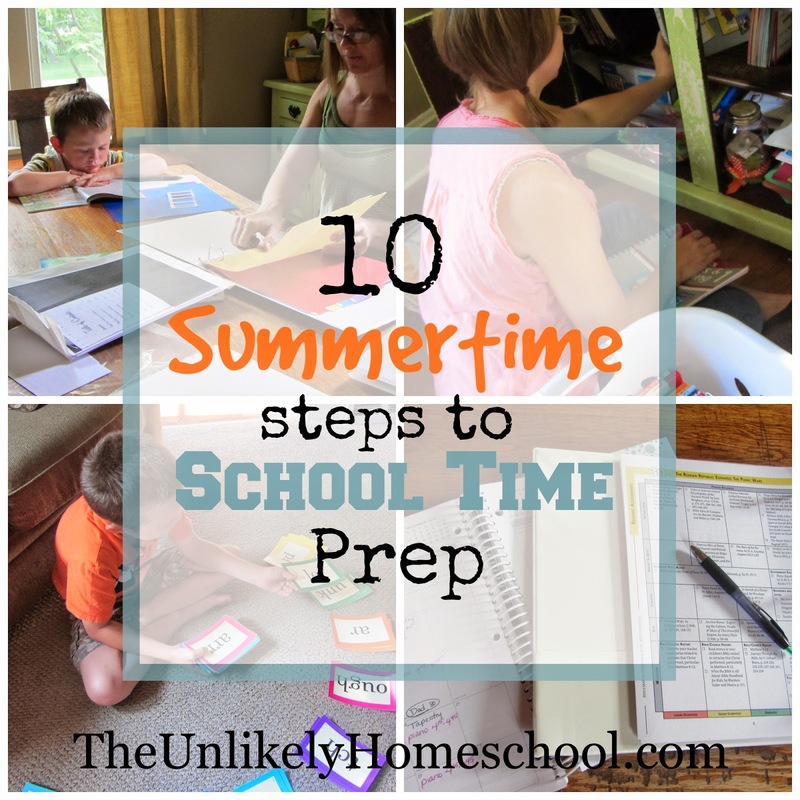 Here's a brief look at my TOP TEN summertime steps to school time prep. Determine a skeletal curriculum plan. Purchase the core of my curriculum at my state's annual homeschool convention. Assuming that I've started the summer with these first three items checked off my list, I can officially go into summertime prep mode. I create an annual portfolio of last year's work. While school is still fresh in my mind, I set aside the first week(s) of summer vacation to prepare our annual portfolio. With our year neatly compiled in a new binder, I feel a sense of closure to WHAT WAS and can begin to formulate plans for WHAT WILL BE. I order any last minute curriculum items. I begin praying for a word from God. I pack away the old and bring out the new. I designate a large portion of a day to sort through last year's curriculum. I toss what needs to be tossed. Set aside what I plan to resell. And pack away all the rest in a tall storage cabinet or a group of plastic tubs in our basement. I bring out all of our "new" items including curriculum that was formerly used by another child and will be regurgitated for a sibling AND any brand new curriculum specifically purchased for the coming year. I organize these into three groups...child-specific materials, group materials, and parent resources. The child-specific materials are packed away in each child's magazine bin, while the other two groups go into the school hutch. I do some basic house cleaning of our school areas. I also use this time to re-organize my flashcards. Since I invest in quality flashcards, they all have a specific numeric order...making it easy for even my kids to put the mammoth stacks back to "start mode". I farm-out this job to my "willing" participant(s)...the ten and under crowd...and start my year with order. I form a school year calendar-of-events. I schedule my entire school year. I sketch out a daily flow. As I've mentioned before, I don't make an actual daily schedule with time slots and rigid order. That's just a bit too unrealistic when you are trying to weave HOME with SCHOOL. But, I do like to have a skeletal plan to how our day will look...how it will FLOW. So, I make a list of all the subjects that need to be tackled each day as well as any home tasks that will require my daily attention...such as making meals, putting The Newbie down for a nap, answering emails...and I sort this out into a "penciled in" order of events. The "penciled in" part is KEY. I can't assume that a flow plan is going to work until it has been put to the test. I usually reevaluate this plan after the first week of school. Often, things need to be tweaked. I take a big gulp and leap...with a smile. The call to homeschool has been one of the biggest blessings the Lord has ever given me. It's a responsibility I don't take lightly. But, even though I feel like I start each year prepared ON PAPER, there's always a sense of "Can I really do this in real life?" I've learned to recognize that as a whisper from the Enemy. So, when summer gives way to fall each year, I hold fast to The Word I was given, hike up my big girl pants, and START. With much fear and trembling...with a little bit of self-doubt...but with a passion for raising up arrows that God will one day shoot forth into the world for their good and His glory. which for us, marks the BEGINNING. The beginning of something memorable. It's almost here and I'm currently working on step 7. I'd better get crackin'! 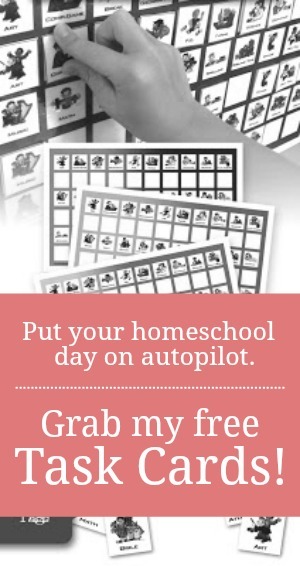 Need more HOW DO I HOMESCHOOL....FOR REAL tips, be sure to follow my Homeschooling 101 Pinterest Board. Thank you for sharing your process. It is always helpful to hear how others do things. I do plan similarly, although, I have a ways to go. We are planning to start Aug 11th and I'm not ready. I do have my calendar started and all curriculum is here. Now, my main thing to do next week is to organize all books and curriculum. Do you buy a new binder for each child each year? That is what I've been doing and it's working out well. Actually, we use one 3 ring binder for History (My Father's World) and another 3 ring binder for all the other material. 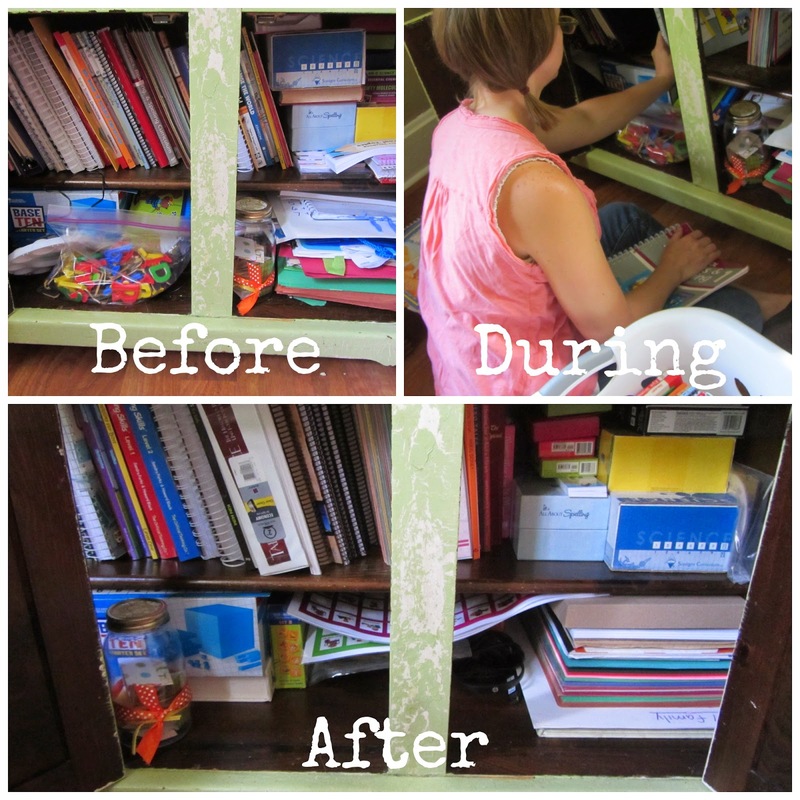 It's always good to get ideas on how others organize and store the yearly materials. I know it can be hard but it is so worth it!!! I am a second generation homeschooler now homeschooling my kids who are starting 4th and 2nd, and then my younger ones are 4 (preschool) and almost 2. Thank you! Blessings to you and your family. Tip #1 was WORTH the price of admission. I'd never thought about or heard about doing your portfolio as you are packing away the previous year's stuff. While the kids and I were packing away last year's work, I just kept thinking about that portfolio, and not 1 time did it come to my mind to take out choice items to assemble in a "just in case portfolio!" Well thankfully, my husband has not taken the box to the attic. Some states require that a certified teacher from your county checks your child's portfolio every year. The certified teacher signs a form which the parent sends to the local school district.